Here's the thing about MNL48: it's entirely based around the AKB48 concept of "idols you can meet." That is to say, these girls are not your typical pop stars who can seem, at times, distant and alienating because of their outstanding physical attributes and elite talents. No, the members of MNL48 -- an official sister group of the Japanese act -- are fairly standard when it comes to the things you'd expect from aspiring music artists: singing, dancing, and looks. The idea is to build a unique rapport with fans by showing their journey from awkward novices to becoming skilled entertainers --similar to a parent watching their child grow. It's a contrast to how South Korea's more refined pop industry works, where groups undergo intense training prior to being introduced to the public. 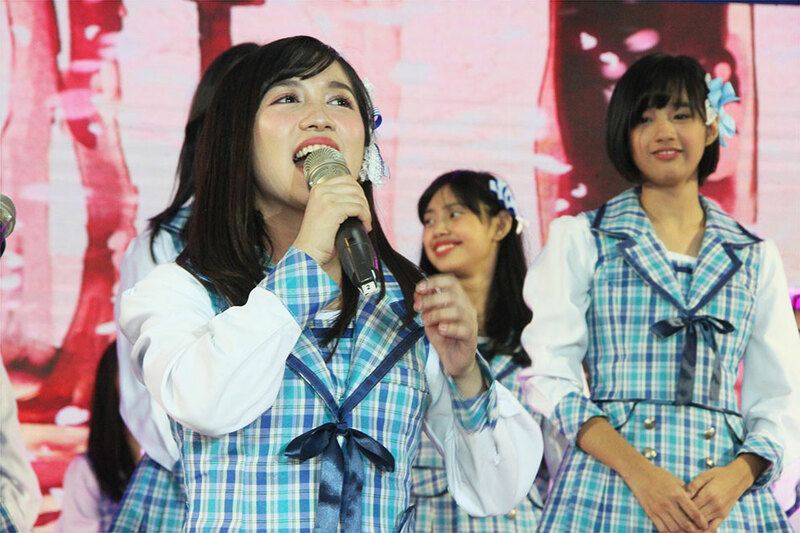 On Sunday afternoon, hundreds gathered at a small events hall in Quezon City to see just how much the MNL48 girls have improved since their audition days on "It's Showtime," back when they were still prone to forgetting dance steps and missing formations. For more than a month, the girls have been living together and practicing original AKB48 choreography in preparation for this moment. Wearing matching Japanese schoolgirl uniforms, they appear from the back of the stage holding balloons with the zeal of bubbly cheerleaders and performed a Filipino cover of AKB48's "Aitakatta," a sugary sweet pop tune about longing. While the difference is night and day from their clumsy beginnings, one would still be hard-pressed to describe them now as precise. However, it's precisely this lack of polish matched with their enthusiasm that makes this budding girl group all the more endearing. Haphazard moments like some members crying mid-performance were met with the most genuine of idol welcomes: glowing lightsticks held aloft. Fans feel they can share in the success of these girls because they're told, repeatedly, that they're responsible for it. "Gusto ko lang pong magpasalamat sa inyo kasi nagsisimula pa lang kami pero ang dami ninyo na po," said a crying Sheki Arzaga, who was voted as the group's center girl via a nationwide poll. "Sana po huwag ninyo po kaming iiwan hanggang dulo." With more than a decade worth of songs, the AKB48 discography provides plenty of material for the MNL48 girls to cover. For Sunday, the group also picked to localize the infectiously catchy "Heavy Rotation" and "Sakura No Hanabiratachi," a heartfelt ballad that elicits feelings of pride, nostalgia, and hope. By the end of their performances, the gratitude was radiating from every member who had a tear in her eye. "Imposible ito kung wala kayo," the group's captain, Alice de Leon, told their adoring fans. Their mission statement is to make their supporters happy and inspire them through their own stories of determination. And considering the positive response and the presence of smiling fans with photos of favorite members printed on their shirts, it looks like they're well on their way towards achieving just that.